This is Nana, an 18-year-old specialty school student. She’s wearing a bright print shirt from a local vintage store under a fuchsia lace lingerie dress that she bought at a shop in the Shimokitazawa area of Tokyo. Her patent chartreuse sandals are from Thank-You Mart. 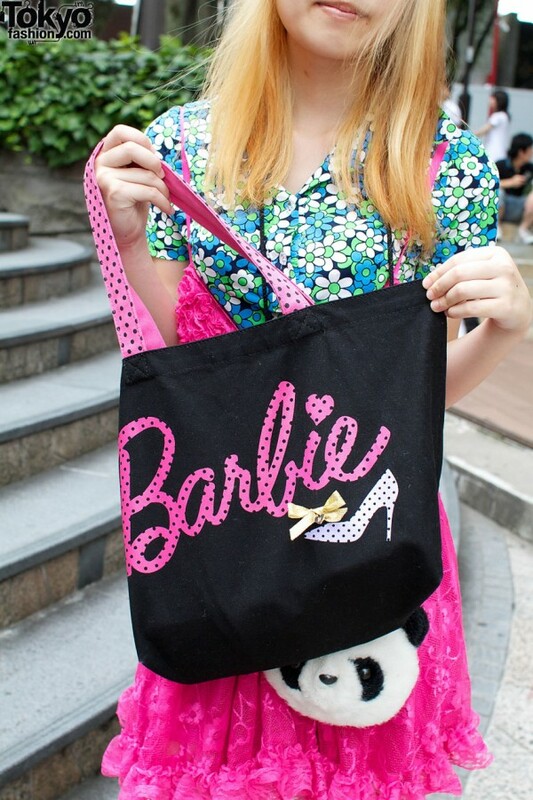 She’s carrying a black and pink Barbie bag over her shoulder and wearing a panda purse around her neck. Nana’s blonde hair is twisted into two odango buns. We asked about her favorite music and she said anime and Johnny’s bands. Her favorite shopping venues are resale and vintage stores. On the Japanese social networking website named Mixi, Nana’s user name is Nanapomo. I love those sandals. The print design of the shirt is lovely. I love the shirt and little panda pouch! The sandals are also neat! I love harajuku fashion, but this particular outfit looks kind of sloppy.